Remember back in January when I said my goal for this year was to eat more whole grains? Oh, you do? Well darn, I was hoping you forgot. Just kidding! I love whole grains, even if I haven’t exactly kept my promise to post lots of recipes that use them. But a few weeks ago, we went to Southern Season in Chapel Hill and I decided to get some freaky weird whole grains to cook with. Like groats! Yes, groats! It sounds like Medieval prison food, right? But this is the year of trying new things! So I bought myself some groats. There are many kinds of groats–it’s a generic term for any hulled grain. Mine happened to be buckwheat groats, but oat groats are pretty common too. Not knowing what to do with them, I figured using them in a stew would be a safe bet. I found that the taste and texture was very similar to barley. 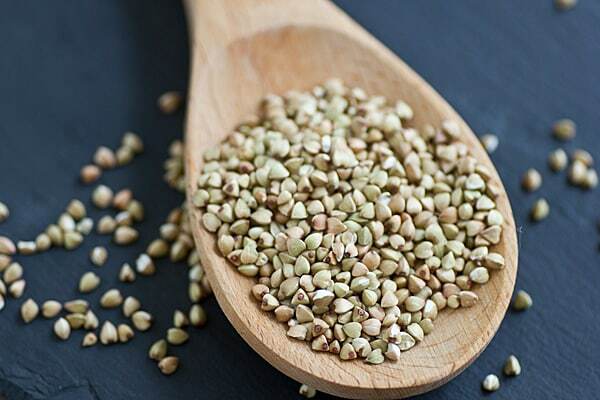 Groats are high in protein and fiber, so they make a good addition to any vegetarian meal. Since there was only one package of maitakes, I added a blend of other wild mushrooms too. If you want to bulk this up with even more veggies, kale, asparagus or fresh peas would be a nice addition. And if you can’t find groats at your local grocery store, any whole grain will do; just adjust the cooking time accordingly or, if the grain needs more than 20 minutes to soften, cook the grain first and stir it into the stew before serving. 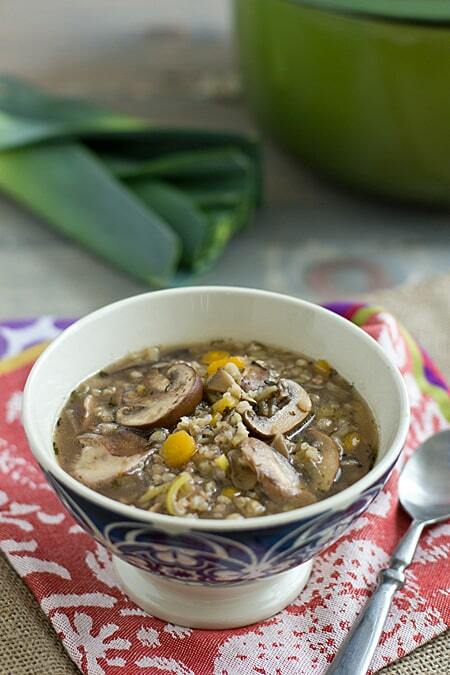 A hearty spring stew made with leeks, wild mushrooms, and buckwheat groats. Heat olive oil in a large Dutch oven over medium heat. Add leeks and carrot. Cook 7-8 minutes, or until softened and beginning to turn golden brown. Stir in mushrooms. Cook until juices are released, 3-5 minutes. Add wine, thyme, and sage. Cook 2-3 minutes more, or until liquid has almost evaporated. Add mushroom stock and groats. Bring to a boil, then reduce heat to low. Partially cover and cook 15 minutes, or until groats are tender. What I Ate This Week | When Life Gives You Free Pineapple Introducing the Oh My Veggies Marketplace! oooohhh I love those mushrooms!! I’m not sure if I can get the assored wild mushrooms here though! Look at those big old mushrooms!! This sounds great. The mushroom has red lipstick! Best mascot-on-a-package *ever*. Love this soup and love that you’re experimenting with different grains. “Groat” is definitely not the best name ever but it looks just about perfect in this stew. A few years ago, we went to Japan & just about EVERYTHING there has a mascot. It is amazing. And I want to go back. Sigh. I get crazy excited to find and try new foods, and groats is one I’ve never had! Leeks and mushrooms are two of my faves and this looks absolutely phenomenal! PS love your new marketplace 🙂 That must be so exciting!! 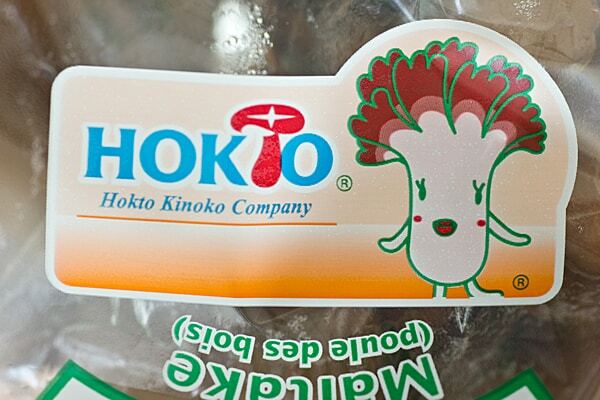 Our WF has a whole bunch of mushrooms with cute little Japanese cartoon characters on the packages. I have to go over and ogle them every time I’m in the produce section, even when I don’t need mushrooms. Because: adorable! I bought raw buckwheat groats a while ago and they’ve just been sitting in my pantry forgotten…I’ve only thought to do breakfasty or snacky things with them, for some reason I never thought of cooking them up to use in a dinner recipe like stew! 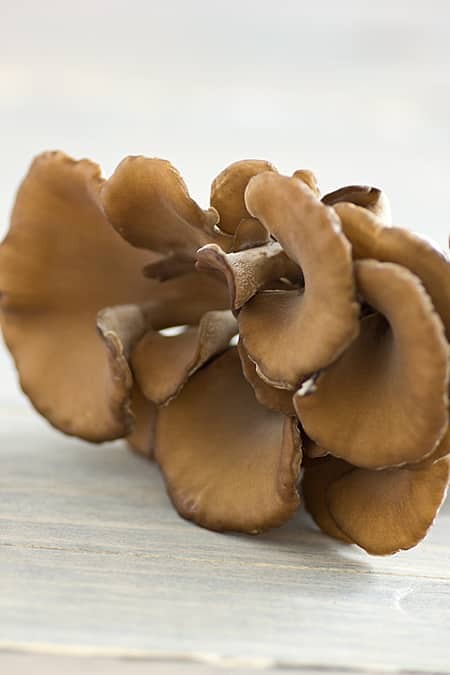 Those mushrooms are pretty beautiful too (for mushrooms that is) – I’ve heard other bloggers talk about maitake but never noticed them in the store…maybe that’s because I rarely buy mushrooms! That’s funny, because my first thought was stew–breakfast or snacks never occurred to me. 🙂 You need to make something with yours and give me more ideas for what to do with the rest of mine! Such a healthy stew with some of my fave ingredients! Those mushrooms are gorgeous! I love this soup with all the leeks and such a rich stock. Very healthy and delicious! Delicious! I need more healthy stews in my life. Well done. Right, just curious what it tastes like, sounds like an interesting combo. Thanks! I am obsessed with mushrooms so this stew is just screaming my name! And even though it’s practically summertime here in LA, I’m still diving into this bowl! I love mushrooms and stew! Goes so well together. Nice and hearty. Hi, this is a great post. I wondered if you would like to link it in to the new Food on Friday which is running right now over at Carole’s Chatter. We are collecting recipes using carrots and/or leeks. This is the link . I hope you pop over to check it out. There are lots of great recipes already linked in. Hi! I’m not a very experienced cook..AT ALL!… but what is the purpose of the wine in the recipe? Can it be omitted as well ? The wine is added for flavor, but you can omit it.